Those who gate in find themselves standing in the middle of a large, sunny meadow, surrounded by many colorful flowers. In the distance vast hills covered in woods can be seen. They frame the expansive meadow, which makes up the field. Monsters could be hiding among the beautiful flowers and within the bushes scattered across the meadow... but it's difficult to remain vigilant in such a peaceful-looking place. It has been a while since Incubus has had the time for The World, but now he has a bit of freedom to play around. Unfortunately, he hasn't seen his could-be friend Count around too much, which has lowered his own motivation to play around slightly. Today, however, he has logged in to find Count very much available. Yet, Incubus has been unable to bring himself to pester Count quite yet. He wants to have a good reason to do it... a good reason like finding a field that his night-living maybe-friend would appreciate. Their last venture together didn't go that well, and Count had probably not really enjoyed himself either, so Incubus would like to make up for that. Of course he had already attempted to find a good place the last time he had been online, but hadn't quite managed to. It had turned out that getting a simple, sunny meadow was kind of a difficult task in a game as large as this. With that in mind, he starts rapidly putting keywords together. Anything that looks like it might lead somewhere promising. Incubus manages to keep himself calm during the few failed attempts he has to endure... and then, he finally lucks out. What a coincidence, for him to succeed when Count is actually around. In any case, now he finds himself in the middle of a flowery, sunny meadow. Incubus takes in a deep breath and takes a few steps forward, looking around. A grin of triumph tugs at the corners of his lips. He fumbles just a bit in his excitement, as he hurries to flash mail Count. It's been some time, hasn't it? I found a field that might be relevant to your interests. ;^) Come to Δ Radiant Infinite Paradise if you want to meet up. Incubus is suddenly struck by the thought that Count might find this kind of a thing more creepy than thoughtful. He nervously ruffles his hair and tries to convince himself that he didn't just come across like a complete weirdo. When will he learn to curb his enthusiasm online? It's been a while since Count had a good, long sit-down in front of his computer visiting The World for more than just one brief foray into yet another field that he wouldn't really bother clearing to the end. He had a lot of trouble finding something that would really hold him in there, after all - sure, virtual reality was beautiful, and the game was a technological marvel of such proportions that if he'd believed in eldritch abomination-gods, he'd wonder if one had been involved in its development. But - what is that? A flash mail that he sees while idly pondering the game's pottery, and the cultural influences upon the designs chosen. Has trouble holding his jaw in its rightful place when he sees exactly what he gated into. 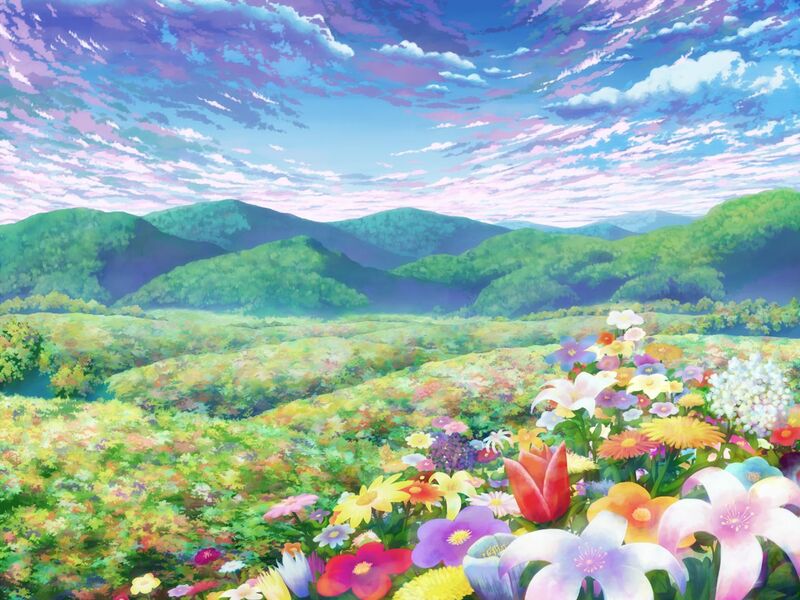 A beautiful meadow, full of flowers, and grass, under a clear blue sky---and the sun, the sun! He stares upwards for a few seconds, looking dazed... before he realizes that, hey, this kind of thing is pretty rude to the person who invited him. He seeks out Incubus with his gaze, and the diminutive fellow turns out to be pretty much right in front of him. He just had to look down for it, that's all. "Hello," he greets, a little bit distracted. "You were right." A party invitation flies Incubus' way. Aha, of course he would be pleased! Good, good. 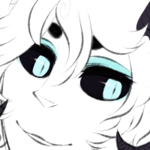 Incubus lets out a smug hum and accepts the party invitation deceptively nonchalantly. Of course, Count can probably tell he's just genuinely pleased by now. They've known each other long enough offline for them to have gotten to know one another relatively well. "My memory isn't too bad," he boasts, grinning. His ears twitch as he steps out of Count's personal space and takes another look around. "What a lovely place. It suits you." Some flirty compliments never hurt anyone. At least, they had yet to hurt him. "Would you care for a stroll... or would you rather just enjoy the scenery from here for now? Both have their appeal." "A stroll would be fine," he decides, firmly pushing the distraction out of his mind. Right, he's not just here to sit there and have a picnic under the sun. He couldn't even have a picnic! VR was cold and unforgiving - he could touch, but not feel. They made the fake food look so appealing, too, he'd wondered if it at least partially had anything to do with food chain partnerships. Oh, well. Not like he minded reminders that his body needed sustenance when he got too drawn into the game, though that was pretty rare. He did have little that drew him into the game, regardless of its technological supremacy and its appeal. So many fields were dark and murky, and dungeons... well, there was very little sunlight in most dungeons. After all, that word implied either being underground, or otherwise a multi-level, relatively closed-in experience. But this... he's going to have to bookmark it. "I apologize for not being online lately. Work has been busy, and I've been spending my free time on other things," he states, as if Incubus didn't know exactly where his free time went. Count begins to walk further into the field - but slowly, taking in the sights. It also helped that he was kind of sort of slow by his very nature. "Alright, on a stroll we go," Incubus says agreeably, stepping to walk alongside Count. He smiles and shrugs slightly. "Nothing to worry about! I've been busy myself, as you know..."
It's not like he hasn't been complaining to Tatsuyuki about his graduation woes. Those, of course, are over and done with, and now he has other things to worry about... but one thing at a time. Right now, he isn't dealing with his real life annoyances, but playing a game with his friend. Impulsively, he bends down to pick one of the pretty, colorful flowers. This one happens to be brilliantly cyan in color. Or is that teal? Ah, whatever. Either way, he glances at the Count mischievously and reaches to try and put the flower in his hair. It'd be cute! He glances up at the flower that "mysteriously" finds its way into his hair, as if he just notices its existence, even though Incubus very obviously literally reached up and put it in his hair a moment ago. Ah... cyan. He sees exactly what the sneaky bugger's doing, putting something of his PC's color into his hair. Silently, he bends down to find himself a nice-looking flower of the deepest red he could locate. And then, he rises, and reaches to vengefully put it into Incubus' hair in retaliation. If they're going to be like this, then they're going to be like this in equal measure. "Not any longer, though," he mellowly responds to the conversation that's going on almost in parallel to what they're actually doing. Incubus blinks, finding himself with a deeply red flower in his hair, courtesy of his companion. After a moment, he chuckles and grins, nodding. It looks like Count caught on to his game. That's very good, considering he hadn't been trying to be subtle to begin with. "Not any longer," he agrees, continuing onwards. He lets the flower stay in his hair. It will probably disappear sooner or later by itself, anyway, he's not in a hurry to help that along. That is, up until they near a tall, thick set of bushes. As they approach, the vegetation rustles - and rises to its feet. Incubus jerks in slight surprise, taking a half-step back. He wasn't expecting the bushes to actually be an enemy lying in wait! But this is definitely some kind of a wood elemental, vaguely resembling some kind of a four-legged animal - maybe a bull but with bulkier legs. It kicks at the ground under its feet, flowers and grass going flying, but its rooted legs slow its advance towards the duo down considerably. "I was wondering when we would have company," Incubus comments. This time, despite getting startled, he's set on not freezing, and lunges forward to try and get a first strike at the beast. This time, it looks like the enemy is not too speedy, so he's feeling fairly confident about his chances...! Thorn Dance. He jabs rapidly at the monster with his spear, taking out some of its HP. It lets out a slightly echoing roar of pain or anger, or perhaps both. Count absently admires his handiwork, walking alongside Incubus for specifically that purpose. There was a lot to admire in this field, and the atmosphere had definitely made him significantly more receptive to happy thoughts and simply trying to relax. But it's a game, and it's a game not made for meditative frolicking, and that makes itself known relatively soon. "At least it's not a murderous gazebo," he comments, ever-stoic, and follows Incubus into battle. He starts off with a simple swing, neither a skill nor a particularly elaborate attempt at a normal attack. He's learned by now that trying to show off just results in missing and misery and a following surge of misanthropy and other "mis" words he can't be bothered to remember right now. Of course, it's when he does not bother showing off that he hits - for a relatively respectable amount of damage, too! He hopes that the monster's stocky, hm, tankiness means it's not about to get some friends in. "Ooh, that looked like it hurt," Incubus comments gleefully, pleased with how things are going so far. This enemy seems considerably less speedy than the centipede-thing they took on during their last field adventure... Incubus shifts his stance and goes in for another attack, feeling confident in his chances. However, before he manages to actually do anything, the beast lets out a furious roar. It kicks at the ground again, sending more grass flying, and then stomps down with its front legs, shooting a blast of green energy at Count and making the ground close to itself tremble. Incubus stumbles, his attempt at delivering a piercing blow to the beast turning into nothing more than a glancing strike. Though his HP still ticks down a little, he notes with a mild amount of annoyance. Well, beggars can't be choosers, and Count definitely was a beggar. A mental beggar, begging for the monster to just---f-word off and never return. He swings, and swings again, and the leafy bull? boar? something bellows in pain - it was somewhat satisfying to hear, and it was even more satisfying to see a portion of its HP bar disappear as if vanished by a skilful street magician. Which he notably wasn't, but, well - he did have a long cloak, so he could at least pretend to be one for the sake of this one joke. Count, making jokes. How terribly unusual. "With but a simple swing of my weapon, I will make your health bar disappear." ... But Count just thinks he's being funny. His annoyance at his ruined attack melts into startled amusement at Count's words. Incubus splutters out a laugh, audible over the sounds of the beast they're fighting, even as he launches another attack at it, sharply and mercilessly jabbing his spear into the monster's body. With that, the elemental being lets out a dying bellow before slumping to the ground, the last bit of its HP gone. Incubus snickers as he rights himself, looking towards Count with completely unconcealed amusement. "I almost missed again because of that...! Buuuut you really did make that bar disappear." Putting his weapon away, he smirks. "Maybe you should consider a side-career in magic...?" "I do already have the cape," Count half-agreed, putting his scythe away and popping the party display window open to assess the damage. Which wasn't really much - it was mostly SP, which would eventually recover by itself, and a little bit of HP, which wasn't anywhere near critical. And the EXP from the encounter was pretty decent, in his personal countly opinion. Satisfied, he closed the window. "But I think it would pay less than my current hobby does, let alone my current career," he continued, beginning to mellowly trudge through the grass and the flowers again. "This is a very nice field, by the way. I think we could make it a "hangout". Besides the monsters, it feels fairly therapeutic." "You do," Incubus agrees, snickering a bit. He smirks. "You could just call yourself something like The Marvelous Count of Magic, too. It shouldn't be too had to make a magician name out of what you have going~." He briefly glances around just to make sure they're not about to walk into any other mobs. As he fails to see any more for time being, Incubus is content to continue walking through the meadow with Count, hurrying a bit to catch up with him. He almost wishes they could really feel the sun right now, but even without those extra sensations the field is quite convincing. Count definitely looks happy with it, at least. "It wouldn't be too profitable, though, yes." He nods, looking up at Count's face. He looks so mellow and content... just that much makes the pain of finding this field worth it. Incubus smiles fondly and turns his eyes back forward. "You're right, this wouldn't be a bad hangout spot. Eventually we'll be so strong that the monsters won't even matter." "I wish we could go out like this in real life," he sighed, beginning to drag his feet a little as he goes a little too deep in thought. Going out under the sun and to places with more nature, for more direct sensations, for more scents, for the genuine breeze and the genuine warmth of the sun's rays... all of that has always interested him. And he could do it sometimes, with enough precautions taken, but he'd have to wear enough on himself and so much sunblock that it'd negate just about everything good about doing it. Maybe one of those days, he could start himself a little bonsai garden. In the meantime, he mostly satisfied himself by wandering around parks when the sun isn't being an utter [censored]. Maybe he could arrange himself a little greenhouse tour, one day. "Do you suppose that there are many other fields like these out there, in The World? I would like to find a field with enormous flowers, so big you could climb them and sit in them. I think it would be interesting to explore..."
Damage?! Where'd he take damage from? Stumbling back, Count gaped as three small, but nonetheless immensely miffed-looking grassy hedgehogs rose from the grass ahead of them. How extremely treacherous.